How To Send SMS Online? 1.Login to Fast2SMS. If you don’t have an account then you can Sign up. Following screen will be shown. Enter your details like name, date of birth, mobile, email. Click on the I agree check box and then press Submit button. 2. After login, select the Bulk SMS option from the left side bar. Once you select that option, following screen will show up. Out of the three options select the route which you wish to use. You can send Bulk SMS using any of the three routes. Here we will take the example of promotional route. 3. Once you select the route, now select the sender ID. 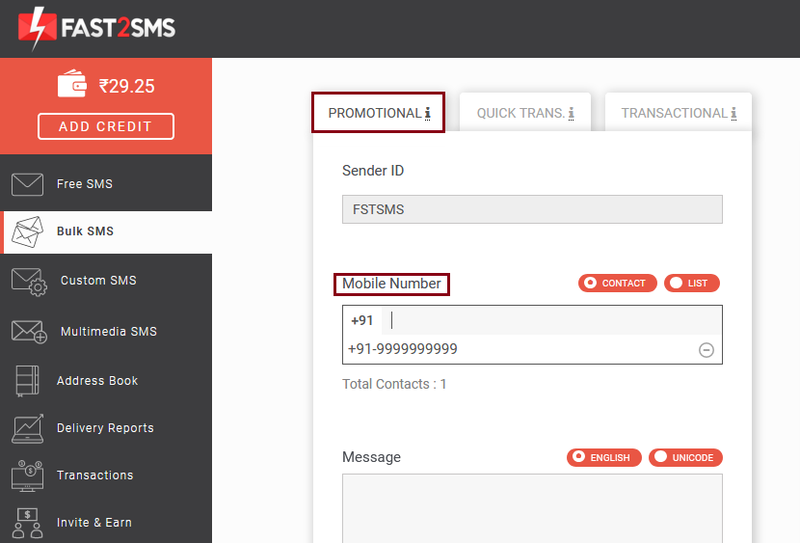 By default sender ID of Fast2SMS is displayed. If you want, you can create your own Sender ID. Click here to know details on how to create Sender ID. 4. Now enter the mobile number you wish to send the message. You can add numbers in lot of ways. Click on Add contacts to know more about it. 6. 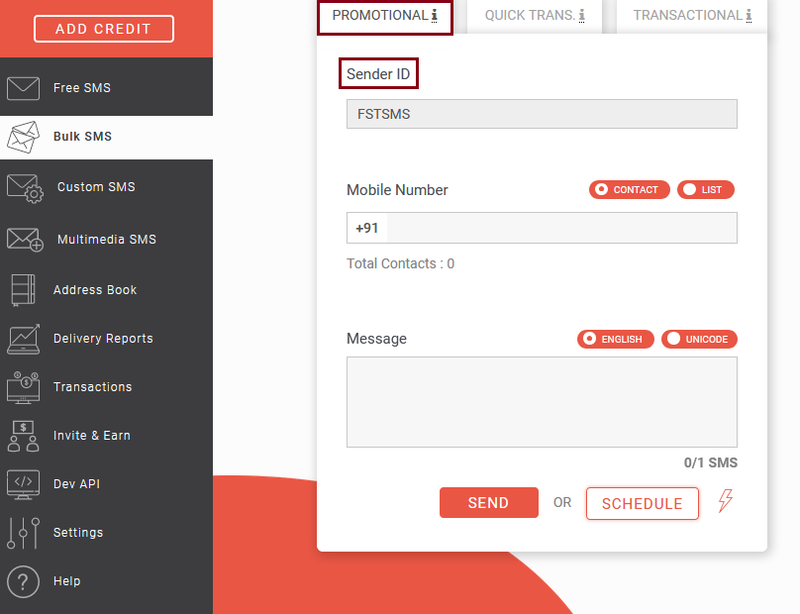 You can even schedule your SMS to send it later. 7. After pressing send the following dialog box will show up. All details will be displayed. Click on confirm to send the message. If you have less amount in your wallet, you can add credit and then send message. 8. After selecting confirm, a green box will be highlighted in the right side of the panel. It will appear as below. This shows that the SMS is sent successfully. 9. You can check delivery report of the SMS after some time. 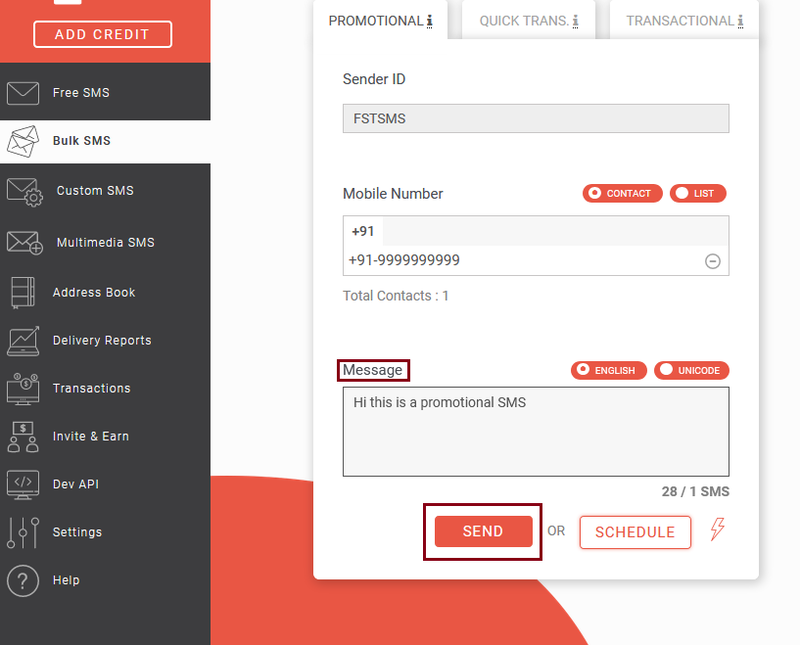 This is the process of sending SMS in Fast2SMS. Hope now it is clear to you. 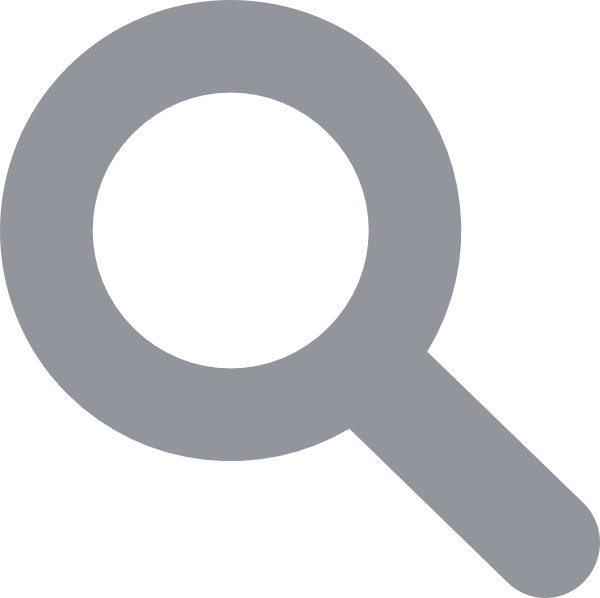 If you have any further doubts or clarifications, contact our support team. Our bulk SMS service provides you the best way to reach out to your clients.